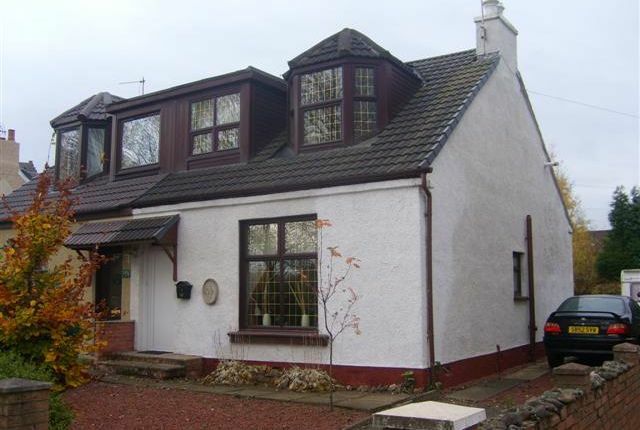 The accommodation comprises bright and airy entrance hall, spacious family lounge with newly fitted gas feature fire. Modern fully fitted dining kitchen. Bright and airy double bedroom currently being used as a second public room. Newly fitted bathroom. On the upper level there is a further double and single bedroom. The Front garden is slabbed, chipped, planted with shrubs trees. Driveway provides parking which accommodates in excess of 3 cars with potential for a garage and turning point. Mature rear garden is enclosed and measures approximately 100 feet long. This garden is well stocked with an array of trees, plants, shrubs and flowers beds. Patio and drying area. Garden Shed. This garden offers huge potential. All flooring, blinds, curtains, fire & surround in the lounge, electric cooker and garden shed. From our shop in Bellshill, head in the direction of Holytown, passing Bellshill Academy, at the first roundabout take the third exit, at the next roundabout take the second exit onto Calder Road, passing through the railway bridge. At the next roundabout at Mossend Primary take the first exit onto Clydesdale Road, heading in the direction of New Stevenston. Follow Clydesdale Road which then becomes Clydesdale Street passing Andersons Building Yard on your right, No 200 Clydesdale Street is situated approximately a further 100 yards on the right hand side.